Tarek Chemaly: Renault Amphicar - because in Lebanon you can ski and swim in the same day! 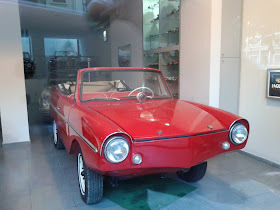 Renault Amphicar - because in Lebanon you can ski and swim in the same day! With the streets clogging, the water all over the place, and the snow at 700 meters. Please meet Renault Amphicar - the perfect car for Lebanon, the country where you can "ski and swim in the same day". There: Problem solved. PS - car pictured is in Achrafieh in the Kehde Classic Cars showroom.